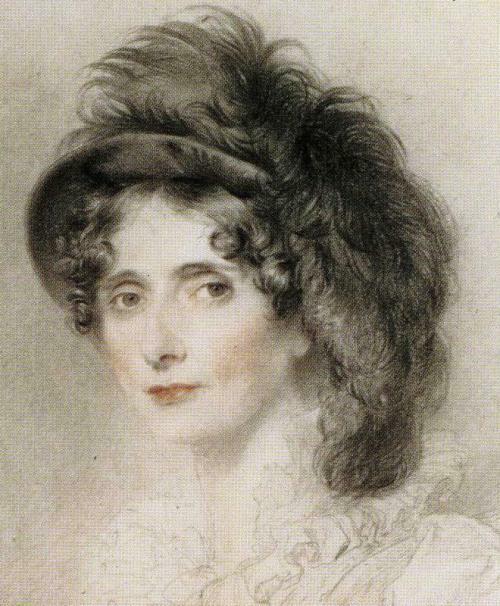 On May 4 1812, Elizabeth, the Duchess of Devonshire, writes to her son Augustus Foster, the British Minister Plenipotentiary to the United States. She sends him copies of Lord Byron's poem of Childe Harold calling it a very beautiful poem. The Duchess also breaks the news that Miss Annabella Milbanke is not interested in him. Apparently, Lady Caroline Lamb had spoken to her directly and was told that Annabella had not even suspected that Foster was interested in her before he left for America. The Duchess thinks that Annabella is looking to marry someone with a fortune. She sums her up with the sentence: "In short, she is good, amiable, and sensible, but cold, prudent, and reflecting." The Duchess is shrewd enough to realize that Byron has some interest in Annabella as a wife. She then passes on more gossip about Byron and Lady Caroline Lamb. Caroline, she writes, "as usual, is doing all sorts of imprudent things for him and with him." The letter of the Duchess is reproduced below.
. . . I have sent you a very beautiful poem by Lord Byron, who continues to be made the greatest fuss with. The Edinburgh Review is just come out with their critique on it. They praise it because they cannot help doing so; but whilst they accuse him of bitterness in resenting their former illiberal review of his " Minor Poems", they, I think, betray how much they smarted, and still smart, under the keenness of his lash in the " English Bards and Scotch Reviewers": Your brother read it to me, which is a favor most rare, I assure you; but it was very pleasant, and I wish he did it oftener. The Character is really all written by Adair, but I own to you I thought with you that it was superior to his usual powers; but it is his and his alone; he did it at my request, and in two days' time. I will send you two or three that if there is anybody you think worthy to possess one that you may give it to them — to Randolph, for instance. . . . As to that particular object, you will have had letters from Caroline and me, which will have, to our great regret, put an end to all our hopes on that subject. The only comfort is that it was, on her part, though not on her mother's, over before you went. She persists in saying that she never suspected your attachment to her, but she is so odd a girl that though she has for some time rather liked another, she has decidedly refused them, because she thinks she ought to marry a person with a good fortune, and this is partly, I believe from generosity to her parents, and partly owning that fortune is an object to herself for happiness. In short, she is good, amiable, and sensible, but cold, prudent, and reflecting. What I have told you is a great secret; you must not breathe it, and I will let you know if there is any change. She is at present with Lady Gosford, but expects her parents this week: we must look out for something better. Lord Byron makes up to her a little, but she don't seem to admire him except as a poet, nor he her, except for a wife. Your little friend, Caro William, as usual, is doing all sorts of imprudent things for him and with him; he admires her very much, but is supposed by some to admire our Caroline more; he says she is like Thyrsa, and her singing is enchantment to him. Dearest life! don't fret about Annabella. I don't think you will, as Lady Selina made a little episode — only guard against American beauties, and we must seek for something more glowing than Annabella; and when you return, who knows what we may meet with. You will have heard of the fall of Badajoz, and the hope of liberating the South West of Spain from Ballesteros being, as it is said, at Seville. Lord Wellington is indeed an eminent Man, and all parties agree in their praise of him. Marmont is said to have invested Ciudad Rodrigo, which must cripple Lord Wellington's movements to the South, but it must be hoped not more than this; and he is said to have taken Badajoz four days sooner than he said, and to have sent divisions oft to Ciudad Rodrigo two days after its fall. I hope there may be some news to send you before the letter goes. Ministers were beat last night on Mr. Banks' motion on sinecure places. To-night is Lord Holland's motion about America, Mr. Henry's business, and I understand that Lord Liverpool will deny it, though they won't give up the correspondence. Pray Heaven that they may be able to do so, and that dear England may remain with unblemished honor. The accounts from Spain seem good (the French retired from Almeida and C. Rodrigo), and doubly good, in that the Portuguese troops have learnt to fight well, even when not in the presence of the hero Wellington. The accounts of riots in France are confirmed, I am told, and " Bread, Peace, or the head of the Tyrant" was stuck upon the Tuilleries. . . . Things are in an uncomfortable state, for though the riots are amongst the manufacturers, there is no doubt but that there are ill-intentioned people stirring them up, and that there is a good deal of alarm, all which would be increased by the sort of unpopularity attending the Royal family from the want of state and show which all communities like, and which the people think their due. I trust, however, that the good sense of the English, and the example of the French will keep all things quiet. ... I told Adair how much you liked his character, and how much Randolph liked it, and he came to me this morning to thank me, and he expressed how flattered he was.